ART program started in Nigeria in 2001 in 25 tertiary health facilities. Currently, eligibility criteria for ART is based on the revised 2014 National Guidelines for Adult and Pediatrics access to ART, wherein HIV treatment is commenced when the CD4 count is 500/mm. An estimated 3,037,364 people (2,798,860 adults and 238,504 children) are currently living with HIV in Nigeria (Nigeria spectrum estimates 2016). In 2015 a total of 2,267,930 persons (2,059,477 adults and 208,453 children) need ART based on CD4 eligibility criteria of 500/mm (Nigeria spectrum estimates 2016). The ART program also incorporates the management of opportunistic infections, cotrimoxazole prophylaxis, isoniazid prevention therapy (IPT) and HIV/TB collaboration activities. The total number of adults and children currently receiving ART in the country as at the end of 2015 has almost doubled since 2011. Coverage however fell short of 80% target for adults (28.9%) and children (27.1%) respectively. The 12 + 1 High burden states(35% of the states in the country) responsible for 70% of the HIV burden in the country accounted for 58.6% of the total number of adults and children currently on ART in 2015. Benue state in North Central Nigeria has the highest number (136,999) of persons currently receiving ART in the country in 2015. In 2015, new HIV infections have dropped by 26% among adults since 2009. Similarly, the number of AIDS related deaths among adults dropped from 143,073 in 2011 to 125,355 in 2015. Among children AIDS deaths dropped from 28,323 in 2011 to 22778 in 2015. Steady progress has been made in the national ART program. More persons have been placed on ART. 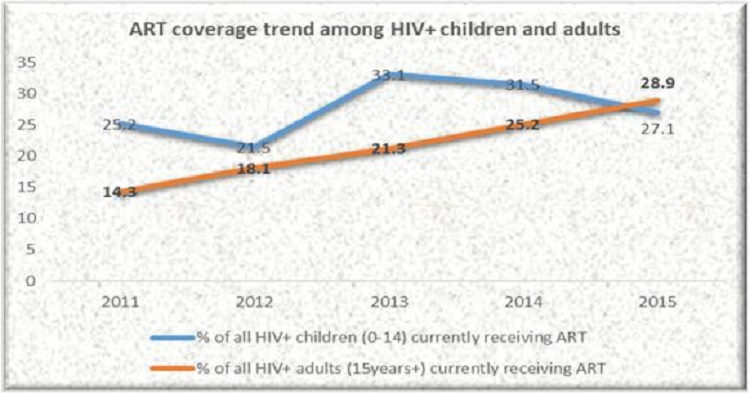 Prioritizing the 12+1 states that contribute 70% of the country’s HIV burden looks to be yielding results as collectively these states accounted for more than half (58%) of the total number of persons currently receiving ART in the country. Also AIDS related deaths respectively are declining among children and adults. However, with respect to reach or coverage much ground still needs to be covered to ensure that more eligible PLHIV receive lifesaving ART. Greater domestic ownership and funding of the ART programme by government at all levels in the face of dwindling donor funding is needed. Increased private sector participation in the ART programme is also critical to increasing ART coverage. Adopting the 2015 test and treat policy for ART is expected to contribute to increasing the number of persons currently on ART and thus increase ART coverage with associated impacts following. The number of children and adults placed on ART has been on the increase but coverage still remains low especially among children. 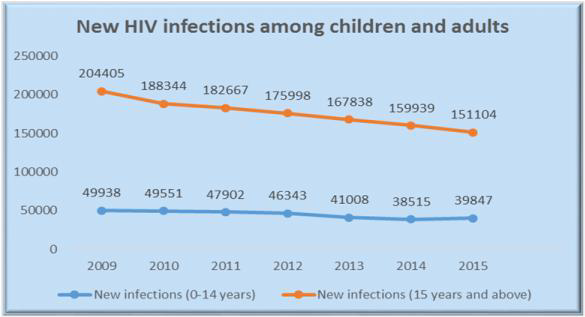 The number of new infections among children increased in 2015. Inadequate coverage of early infant diagnosis (EID) services. Funding gaps and reduced donor funding for HIV programs in the country.